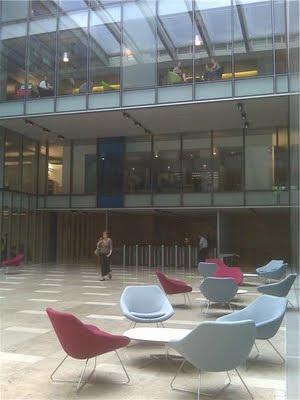 Visiting a new office block recently I was asked what I thought of the new foyer, really a covered courtyard. Despite the pouring rain, it was light and very airy. Whilst some attempt had been made to create a welcoming reception with informal seating for visitors, it was still a bit stark for me. I like minimalism but even allowing for circulation space the furniture did look like a bit of an afterthought. As we continue to design schools there is much that can be learnt from a number of non education work environments. Interestingly, there is a trend of Heads and teachers looking at spaces that have nothing to do with education and incorporating what they see there in to new schools to make more effective working environments. At last - hooray! One hundred and ten and counting..